When it comes to modern prestige, the Cadillac isn’t the first car that comes to mind anymore. However, the 2017 Cadillac CTS is definitely leading the company’s efforts to recover its iconic status. The CTS has been named one of the 10Best by Car and Driver three years in a row. Mid-sized luxury sedans must work hard these days to stand out, and you could argue that the CTS does this with extra style, performance, ample features for its price. The standard edition is definitely dressed up with soft touches and fine amenities, with a base MSRP of $46,990. It comes with leatherette upholstery and eight-way power seats in a well-styled, high quality cabin. If you want real leather upholstery, all you have to do is upgrade to the next package. You’ll also get climate-controlled front seats and a power-adjusting steering wheel, among other modern amenities. Design elements grow richer with the Luxury edition. The Premium Luxury edition adds heated rear seats, a power rear sunshade and a tri-zone automatic HVAC system. It also has illuminated door handles and front doorsill plates. Even if the vehicle doesn’t have the same status as a Mercedes-Benz E-Class sedan, the CTS is definitely ready to impress the boss, your clients, or your neighbors. GM has emphasized onboard connectivity, and this shows with the CTS. Unlike some luxury vehicles, you get every one of today’s essentials on the base edition. This year that means the CTS buyer gets Apple CarPlay and Android Auto for extensive smartphone integration. The Cadillac User Experience system includes an eight-inch touchscreen, three USB ports, satellite capability and HD radio. While it isn’t the best system on the luxury scene, it is impressive and fairly simple to use. A Bose 11-speaker audio unit delivers surround sound. Buyers also get a wireless smartphone charger and access to OnStar with Wi-Fi. Higher editions add navigation and a 12.3-inch digital instrumentation panel. On the safety front, every CTS has Brembo brakes and a rearview camera. Many buyers will want to step up to the Luxury edition for its significant crash avoidance features. Cadillac offers the unique GM Safety Alert Seat as part of the lane watch and collision watch system. The Alert Seat notifies you of any immediate issues, like swerving out of your lane, and the car itself is equipped to steer you back into place if necessary. To help avoid other side swipe situations, there’s a blind spot monitor and a rear cross traffic alert. At this trim level, the car also comes with rain-sensing wipers and automatic high beams. You’ll have to fork out more if you want collision mitigation with automatic braking, a 360-degree camera display, or a self-parking system. With its nearly 50/50 weight distribution, the Cadillac CTS is primed for racy handling. The car’s available Magnetic Ride Control determines millisecond after millisecond how the vehicle responds to bumps and dips. You can drive how you normally would, while the car adapts to give you the smoothest possible ride. 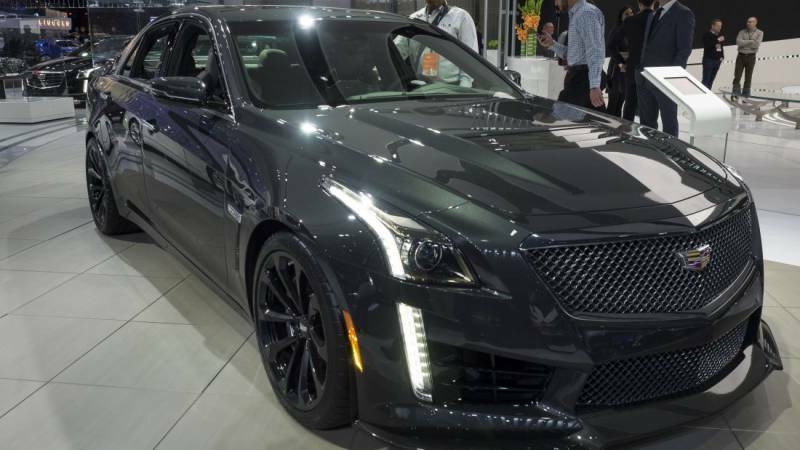 As the highest trim available, the CTS-V seeks to earn its expensive price with a supercharged V8 engine. The car produces 640 horsepower and 630 lb.-ft. of torque. The downside, besides the price tag, is that you can’t experience the joy of all that horsepower on open public roads. That’s why it makes just as much sense to save your money and go for the 3.6-liter V6 twin turbo. Cadillac scores with this V6 that can turn out 420 horsepower and 430 lb.-ft. of torque. Still, this powertrain is costly, and that means most buyers will go with one of the other two choices. The regular V6 delivers 335 horsepower, plenty to power this sedan. Even the base engine is remarkable. This four-cylinder turbo delivers 272 horsepower and 295 lb.-ft. of torque. In fact, the inline-4 beats the V6 by 10 lb.-ft. of torque. Let’s face it, these vehicles are not made with fuel economy in mind. However, turbo technology helps to keep things in check. The inline-4 turbo earns 22 mpg city and 30 mpg highway. By contrast, the Audi A6 turbo earns a more respectable 24 mpg city and 34 mpg highway. The regular V6 does fairly well with 20/30 mpg. All-wheel drive drops these figures even lower. The twin turbo earns 16/24 mpg, but at this level, it’s likely you’re looking more for power than fuel economy. The supercharged edition drops very low with 14/21 mpg ratings. European rivals are generally bigger than the CTS. That’s incentive right there to try out a Mercedes-Benz E-Class, BMW 5 Series or Audi A6 if you’re looking at size. The A6 starts you off with leather seats, an extra cost on the CTS. Cadillac doesn’t offer a Night Vision feature like you’ll find on the options list for the Audi A6 or the Mercedes-Benz E-Series. On the other hand, you’ll have to step up to get Apple CarPlay and Android Auto on the Audi. The BMW 5 Series has standard navigation and a bigger trunk. However, you won’t get a standard rearview camera with BMW. Mercedes-Benz and BMW offer massage features that aren’t yet on the CTS roster. The Lexus GS has pushed ahead of the CTS and many rivals by making significant crash avoidance features standard. This includes lane departure assist, automatic emergency braking, and high-speed dynamic radar cruise control. When buying a luxury vehicle, you’d hope that it does something remarkable. Cadillac’s most original feature is its Rear Vision Camera. This takes the idea of a rearview camera and makes it even better. If you don’t mind live footage running in your rearview mirror, you can use it for every lane change. It certainly does well for backing up. Since it’s a camera, it picks up much more than the driver would normally see. When buying at the base level, some will balk at the fact that you have to spend so much and still tack on extra to get a leather edition. Others will balk at the fact that you can’t get the safety features you want until you step up to the Luxury level. A handful of drivers will complain that the turbo just doesn’t save enough at the gas pump. Also, just because it’s called a luxury vehicle doesn’t make it spacious. The CTS has limited rear seat headroom, making it a poor choice for those with teens or frequent adult guests. The 2017 Cadillac CTS may not be the only midsized luxury sedan to offer style, performance and technology, but it definitely does a good job of delivering on its promises. Unless the smaller backseat is an issue, you may want to put this one on your luxury test-drive list.